When you are educated in a particular topic, it’s easy to forget that not everyone else in the world knows what you are talking about. I’m guilty of using architectural jargon when talking to clients. It can be difficult to remember that what I’m paid to do for a living is because I am highly educated and skilled in areas of space, design, and building. I’m learning more and more when working with new clients who might have never engaged in a building project before to break down exactly how this collaborative process will unfold. Step one is an initial meeting with your potential designer or architect. I described this in detail a few weeks ago, check it out here. After your initial meeting, if both you and the Design Professional want to move forward with working together, the designer will prepare a proposal with scope of work and contract for you to review and sign. I do this all online with Dubsado so no in-person signatures or delivery of contracts is required. This makes for a seamless start! If you sign a contract with your Design Professional, they will invoice you for a retainer or deposit and once that is paid, the project gets started! If you don’t have a concept, you don’t have a project. This beginning phase can look a little different depending on the type of project. If yours is a new-build or a commercial project, it will likely involve more steps such as a feasibility study and permit research. If it’s interior design with no architecture, it may involve less. Since I’m taking you through the process on Midnight Midcentury which is a remodel with interior design, that’s the type of project I’ll be discussing here. The first thing I do once a contract is signed is to set up a site visit where I will take photos and measurements of the space to be designed. This step goes a long way. 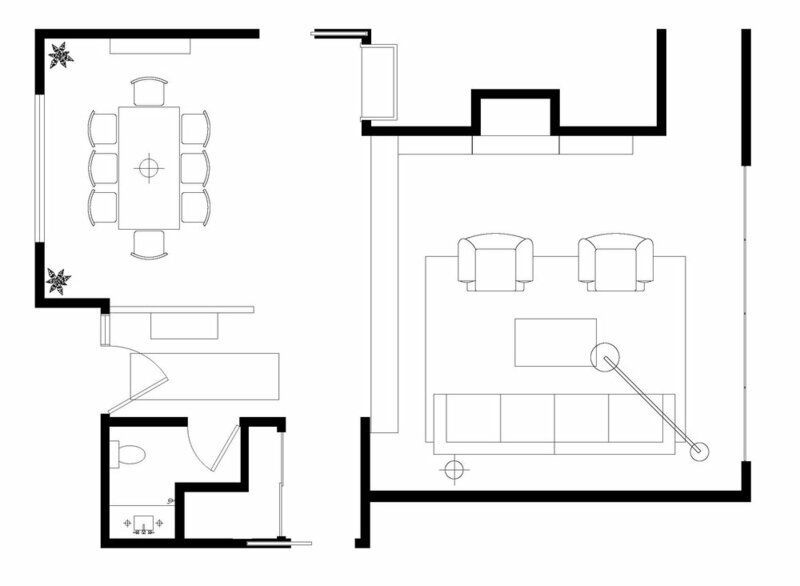 After that initial meeting is over, I immediately draw up floorplans of the space and utilize the photos frequently to refer back to the existing and surround spaces. 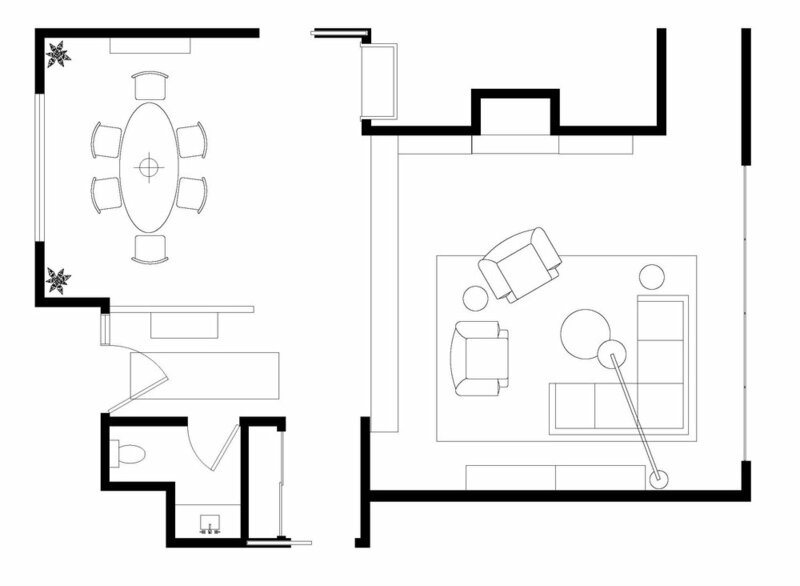 In the case of Midnight Midcentury, I’m redesigning the front entry rooms of the home which have pocket doors closed off to the rest of the house, a hallway that attaches to the other living space, and big sliding doors that visually connect it to the newly re-designed backyard. I was also told that the curtains in the dining room had to stay as well as one piece of art. At this initial site meeting I will also gauge the client’s desires for the space and go over their Pinterest board to determine a style direction. Now that I have gathered all the information, it’s time to sit in front of my computer and pull together imagery that will help my client more specifically determine the visual concept we will develop for their space. These are the concept mood boards that I put together for this project. At the same time, I am drawing up space plan options. These are crucial to begin to determine size and location of furniture, fixtures, and equipment. Here are the three planning options that were presented to the client. I try to ensure that all my presentations happen face to face - whether that is an in person meeting or a video conference - it’s critical for me to be the one walking the client through the boards so they understand the concepts, the reason why something is sized or placed where it is, as well as the the clear difference in the various schemes. After this meeting, I generally have some pretty good feedback and an idea of how to move forward, but I also send the pdf to the client and ask them to give me written feedback. This is important to give them additional time to review the details of what has been presented as well as show it to their spouse or partner if they weren’t able to be at the meeting. Then, the client will send back the pdf within a set amount of time, marking out things they don’t like and circling things they love. This feedback loop is critical for my next step which is taking the desires from the concept phase into the design development phase. Stay tuned as I walk you through that process next week! How many people does it take to get a 500 lb tub from the garage up to a second floor apartment? 8. It takes 8. This week, the finish work begins in our Master Bathroom renovation project. Finish work - which is the work you see when you look at a final project - always moves so quickly compared to all the prep work. But the prep work is very important, of course, as it's the backbone that holds the project together. You just never notice it - at least in a well done project. In the case of our Master Bathroom renovation project in Brentwood, Los Angeles, the plumbing, electrical, and walls were important things that needed to be well prepped before tiling could begin. Now the plumbing has been located in the proper places for two sinks at the vanity, a new shower in the niche, and a new freestanding tub. Electrical was also moved to make more logical placement of the switches instead of the old locations which had four different switches all throughout the bathroom (completely ridiculous and highly inefficient!) We also simplified the lighting by adding recessed fixtures in the middle "aisle" of the bathroom as well as one fixture in the shower niche. After these two major items were completed, the cement/mortar bed was done everywhere where tile will be located. Now it's ready for the tiling! Flooring is the first step, which is about half way done as of last night. Stay tuned for more pictures as this project will quickly come to completion! Floor tiles are halfway complete! Nice flush transition to the wood flooring at the Master Bedroom. Partial demo....or Contemporary Art Exhibition? You decide. The Master Bathroom renovation project which we refer to as "Blatau Residence" is officially under construction as demolition began last week! Since this is a condo project and the previous work that had been completed was done quite poorly, the homeowner wanted to first do total demolition before ordering all the materials and fixtures, so it will be a week or so before the new construction begins. But the good news is the existing conditions are all good and ready for our design to be implemented! It's always so interesting discovering what is in your floors and walls. It can really unearth how lucky you really are, as was the case in this project where there was no waterproofing membrane at the shower. Just concrete on top of the plywood. Our contractor asked the client if the downstairs neighbor ever complained about leaks, they didn't. The plywood sub-floor also doesn't have signs of dry rot. So lucky. Hire a good contractor! Don't do work yourself if you don't know what you are doing!! You can have major problems down the road that you could be held responsible for!!! Take a good long look at these "Before" photos, because before too long, you won't be able to recognize what we've done to the space. I don't need a designer, I'll just Do It Myself! Understandably, this is a common thought among home owners... you know your own tastes, you've conquered smaller projects on your own, and you may even be handy around the house. While there are certainly success stories, as Designers, we are often called upon late in the game to try to save the day for a DIY project gone awry. Architects/Designers are trained not only to innovate, but also to execute a design. Unfortunately, many issues can arise that result in a conceptual design looking distressingly different than the final product. In addition to creating the most beautiful looking design, Architects/Designers are experienced in sourcing materials, balancing proportions, and optimizing the efficient use of space. In this post, we'll provide you with information of which homeowners are often unaware, based on our experience with residential design projects. You will spend 100x more hours than any Architect/Designer searching through tile showrooms, not even know where to begin when it comes to flooring, and your head will really start to spin when it comes to lighting selection. That's because this is what we do! You may know Home Depot and one or two really high end showrooms, but we know everything in between. Architects/Designers do this for their job every day, and even the specifics we aren't as familiar with, we will find out in half the time it would take you and will only show you the best and most closely aligned to what you are looking for. We not only have the eye, we get all the trade magazines/emails, go to all of the events, and always know about new products because the companies come to us. Oftentimes the best products (and the best deals!) are only available for purchase by an Architect/Designer. This is our job and there is a reason that people pay for it, because they don’t want to lose their minds. The best Architects/Designers go to school for 5-7 years learning primarily one thing: how to make beautifully functional environments. We take everything into consideration: proportion, rhythm, material, details, distances between objects, thicknesses, electricity, plumbing....The list goes on and on. These are things you might not ever think about or even know are present, and that is the best reason of all the hire an Architect/Designer - because the essence of your project is in the details. If you've ever seen a bad tile or drywall job, you know what I mean. Your Architect/Designer is not going to let that happen. Aside from just the details, when you have a space that needs a new flow or function, we look at hundreds of options and configurations before showing you the top 2-3 results. In other words, we spend the time so you don’t have to. Because of our many years in school and access to amazing 3d graphic programs, we can do this stuff pretty quickly! No matter the age of your existing abode, chances are you don’t really know what’s going on in those walls, unless you built it yourself, in which case, you probably aren’t reading this because you are an architect/designer/contractor. The thing is, we’ve seen the best and the worst case scenarios. Best case: when demo happens, the guts of your house have no issues and the contractor can follow your Architect/Designer’s plans without delay or a hundred change orders. Worst case (and this is a true story that we have dealt with): one entire side of your house has been completely eaten up with dry-rot due to slowly leaking windows over the past 20 years. It needs new structural columns and framing. It was one earthquake away from falling down. You need new windows, because they are compromised everywhere in the house and you don’t want this issue to continue to happen. You will need brand new stucco job on exterior because of all of this new work. All of these unforeseen issues snowball and now you are looking at a total interior and exterior renovation that began as just a few rooms of your home interior renovation. Luckily you have your Architect/Designer on hand to help you through this process. They can design great, on the fly solutions specifically for your home and its conditions, adapting their existing drawings, pulling new permits as needed, and staying in close contact with the contractor along the way to ensure you don’t get hit with more of a bill than is necessary. After all, if you've been smart in your renovation/addition project, you've had your Architect/Designer on hand since your initial idea phase and they know the project better than anyone at this point! If you are doing anything structural - you need a structural engineer to do calculations and give advice - we know structural engineers and hire them for you. Ditto for electrical engineers, lighting designers, and interior designers - as well as any other type of speciality that may come up (again, depending on the scale of the project), such as a kitchen designer, LEED specialist, etc. Your Architect/Designer will be able to recommend, hire, and coordinate the best of all the other specialities needed to bring your project from concept to completion. Referred to by Architects/Designers as Construction Administration - CA for short - this is by far the most important aspect you want to ensure you keep your Architect/Designer on hand for. Many people wrongfully think that since the Architect/Designer already did construction drawings and specified all the finishes and fixtures for your space, that they don’t need there services anymore. The problem with this thinking is that contractors never know 100% how to build everything per the plans and other documentation, there will always be questions - called RFI's (requests for information), no matter how detailed your Architect/Designer has been. It can be some small detail that was overlooked, a drawing in question because they contractor does not understand something specifically, etc... Either way, during construction is the time where you will rely on your Architect/Designer to answer all of these RFI's for your contractor as well as be on site occasionally to oversee that all the materials and details are coming together as planned and that your project will be as beautifully built as it was intended to be per the design. Some people may shortchange themselves because CA services are billed hourly, but don’t be one of those people! The nominal amount of hourly dollars that will go to your Architect/Designer will actually save you money by not having to make the contractor fix things he messed up that you didn’t notice until it was too late - your Architect/Designer will notice right away before the cost to redo things becomes an issue. Don't worry that your Architect/Designer is just spending time on site to make money, they aren't! They have an equal investment to ensure the project is built correctly and beautifully, because they want photos for their portfolio and a happy client to give them future referrals. To keep cost concerns at bay, you can ensure that your contractor sets benchmarks with your Architect/Designer as to when they should come to the site to review the construction progress and specific details. Oftentimes it will be once a week or a few times a month, depending on the length and scope of the project, with phone calls and emails with the contractor in between. Ultimately, having your Architect/Designer around will keep everything running smooth during the construction phase and ensure a beautifully constructed finished product. We hope this post has been helpful in your beginning thoughts of your upcoming home renovation/remodel/addition. If you want any further advice, feel free to give Bone Carroll Studio a call at 424.273.5053 or email us.